This report is the product of a collaboration between AMES and Deloitte Access Economics. 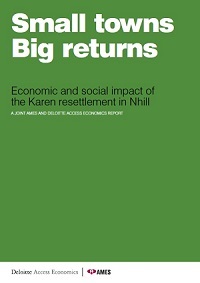 Since early 2010, approximately 160 Karen refugees have resettled in Nhill, a small town in north western Victoria. The report provides new and important insights into the economic and social value that can accrue from the resettlement of refugees in regional Australia, and identifies factors that contribute to their success. Download the full report below. AMES & Deloitte Access Economics (March 2015). Document name: Nhill Report.